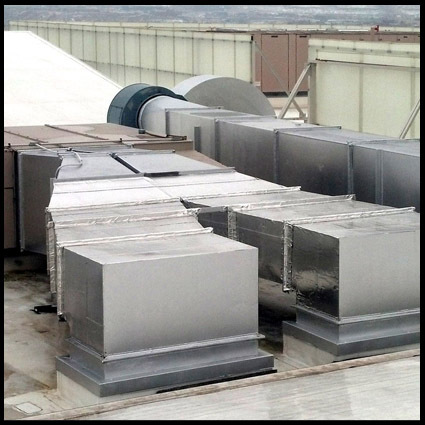 Rust creates continuous problems for many HVAC installations in office buildings, schools, hospitals, hotels, malls & stores, and manufacturing plants. 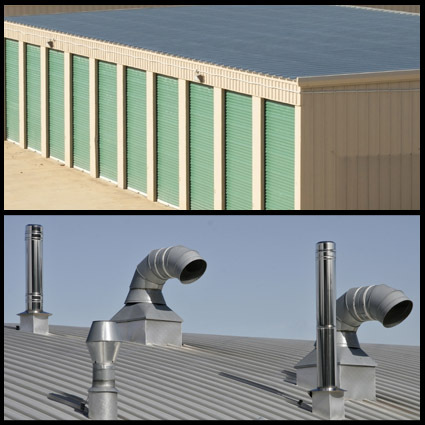 When exposed to moisture and air, rust is generated on any metal surface over time, including HVAC external duct work, cooling towers, drip pans and flue ducts. This problem is hard to manage, difficult to solve, and expensive to repair. Rust is a serious maintenance issue that many people have contended with for a long time. ESeal is a new peel and stick composite that solves all of these issues instantly with easy application, no downtime, no complicated prep work or priming, and no toxicity. ESeal is a complete solution for the commercial HVAC markets that offers repairs that last in excess of 10 years after application. 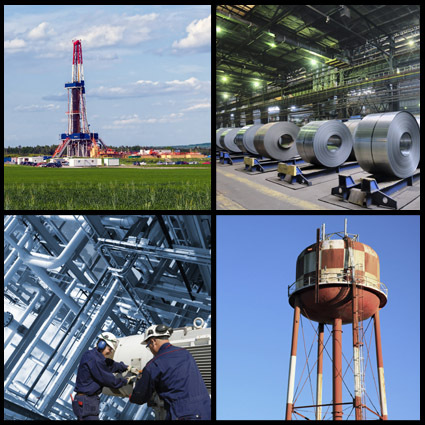 Many industrial companies have a variety of metal corrosion related maintenance issues. ESeal's unique characteristics protect surfaces from corrosion, and encapsulate and stabilize areas that are already corroded. 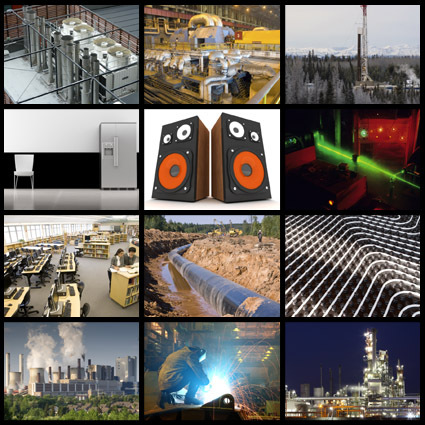 The benefits of ESeal are applicable to many industries. 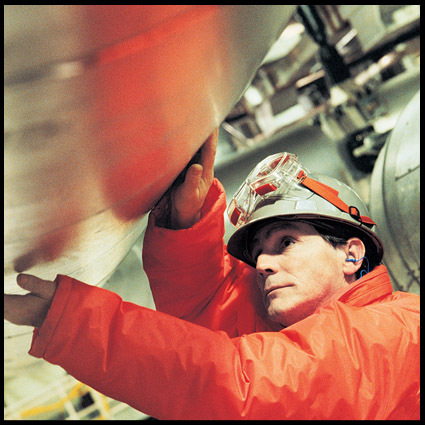 In the gas industry, for example, in-ground pipes can be permanently protected from corrosion with application of ESeal on the entire pipe, or alternately, to areas where corrosion is beginning to appear. ESeal offers in-ground protection that helps to retard corrosion caused by water contacting metal. In the steel industry, large industrial ducts are exposed to acidic environments like those in the coke furnaces, and corrode right through. Replacing such duct is expensive and time consuming. ESeal is economical and quick to fix. Also consider the many large storage tanks, chemical tanks, & water tanks where external rust and corrosion is very much an issue. Now available in strips up to 100 ft long, ESeal is able to cover large areas efficiently. WHEN IT LEAKS, IT LEAKS . . .
METAL SEAMS & PATCHES OF ANY KIND. Roofing protects the building, equipment, and belongings for 20 plus years. But after time, weather, and perhaps a few maintenance people’s work boots or dropped screws, roofs ultimately leak. In addition, winter ice or summer’s direct sun cause flashing to loosen, allowing walls or chimneys to leak and damage walls. Fortunately, ESeal is able to extend the lifetime of the roof another 10 plus years. ESeal sticks to every surface, including EPDM, TPO & PVC roofing, shingles, flashing, chimney stone and brick. ESeal’s adhesive covers and stops all leaks. ESeal’s aluminum-sheet top layer is weather resistant and heat reflective. With that, ESeal’s total composite offers protection for many years, through seasons of stormy weather and hot and freezing temperatures. While on the roof, property managers and roof contractors can easily identify additional repair issues where ESeal would be the preferred solution. Consider ESeal to wrap rusted external duct or cooling towers. Or protect organic based roof materials from the damage vented grease would do, by using ESeal as an underlay for grease guards. ESeal has many characteristics that make it invaluable for small repairs. The combination of a heavy gauge aluminum surface with a thick layer of butyl rubber adhesive gives ESeal workability and durability suited to a wide range of repair types. ESeal has thermal barrier properties that are unique. ESeal has adhesion properties that cause it bond to almost any surface, and the adhesive also offers advantageous vibration & sound deadening properties. ESeal is weatherable and waterproof. ESeal is non-toxic, odorless. ESeal is malleable and forms a protective long lasting barrier that protects surfaces. Stock ESeal on job sites, at your facility, or in service vans for a quick and easy repair solution with long lasting results. ESeal is a new product that is just now becoming known by many companies. There are many applications with ongoing problems and the need for a better solution. ESeal has proven qualities that offer advantageous results. Immervin believes in the performance of ESeal and we are willing to test and confirm ESeal as the right solution. We would like to hear from you with any suggestions for use, or questions about how we can work with you to solve issues with ESeal. Please feel free to call us to talk about the ESeal potential. We are hearing from people across the world, in many industries, with many different issues that need solutions.